KNOW SOMEONE WHO WOULD LOVE THE HAIR COMPANY? We would love to have more amazing guests like you! Become a part of The Hair Company’s 20-20 Refer a Friend Program today! CLICK HERE to download $20 printable 'Referral Cards' to pass along to your friends. Simply print out the gift certificate that appears when you click on the link above, BE SURE to put your name in the 'Invited By' line, your service providers name on the 'with' line have them bring it in when they come in for their appointment. Make sure your most current mailing & email information is up to date in our system so that we can send you your free gift. 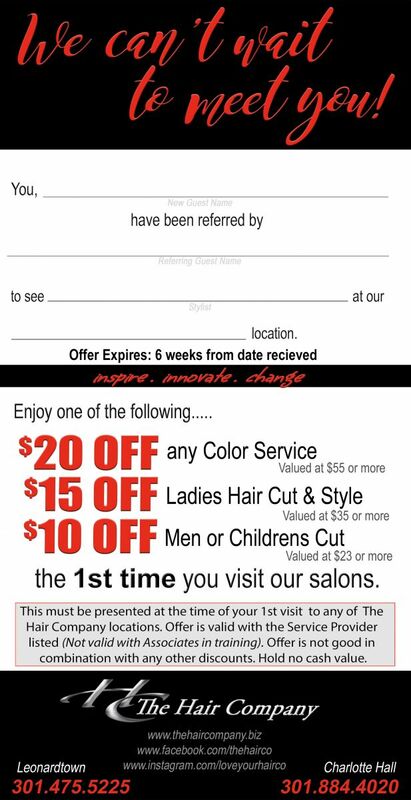 Feel free to print as many vouchers as you want & get started today referring your friends to The Hair Company Salon!